Everyone around Scottsdale loves to walk in the bush. Where you are in the world, you may call it "forest" or "woods." 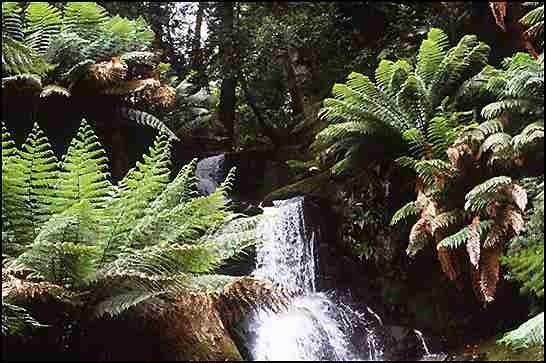 If you're around the north-east of Tasmania somewhere, then there is plenty of bush to be explored. There is just something so special about it, the smell, the sights and the sounds. Its just so fresh and natural. You're likely to see some beautiful rivers and streams, some fantastic birdlife, as well as the odd wallaby or wombat. And on you're way, or when you get to where you're going, you may even see a great panoramic view. This is a real gem. 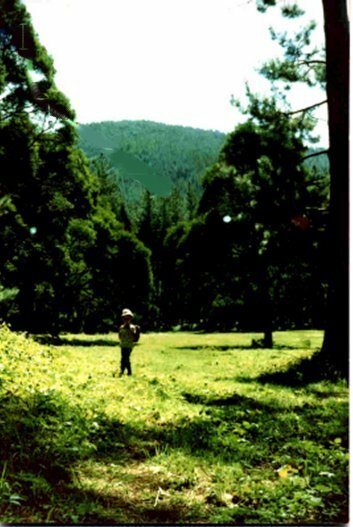 Just fifteen minutes drive from Scottsdale through true beer hops, dairying, and trout farming country, you will arrive at a pristine grassy picnic ground surrounded by towering Californian redwoods. Have a barbeque here, then take the twenty minute arboretum loop walk through majestic pines, typical Australian bush, superbly lush wet forest, very English poplars and dark and mysterious woods. Ideal for a Sunday afternoon. Take the dog and have a game of cricket on the green grass. A real Scottsdale tradition. Again drive through the superb hop country around Scottsdale, 10 minutes to the south, and turn right at the sign at Tonganah. Arrive at the car park with great expectations. The walk is a slow uphill climb for about an hour or slightly more on the way to the falls, and then downhilll on the way back, so it is about 2 to 3 hours return. Beware of the leeches, but have great fun! The falls are great. The start of this walk is only 10 minutes from central Scottsdale. Just drive south on the Tasman Highway and turn left at Flowers by Arrangement. Go through a couple of gates on this road, leaving them the way they were of course, and arrive at a big grassy patch where the road practically ends. You will see the track heading up the mountain over the barbed wire fence. This is a very popular climb, and takes about 45 minutes to get up there, and it is quite easy. The first section is steep, and then levels off. The track is marked. At the end you will arrive at a large granite outcrop and you will be rewarded with spectacular views of the north-east. Quite a similar climb and panorama (though from a completely different vantage point) to Mt Stronach, though the forest on the way up is wetter. You head out towards the Springfield Forest Reserve and keep heading up into the mountains. There are more great walks in the north-east than can be featured in this small sample. Including some at Mt William National Park. For detailed inside info, as well as maps and directions, see the experienced people at Forestry Tasmania, Scottsdale Office, Ellenor Street. Location | Getting there | Sport | Nightlife | Attractions | Accommodation | Links | Email Us!